Bead and drop, antique gold-finished "pewter" (zinc-based alloy), 12x9mm-26x17mm single- and double-sided assorted cross. Sold per pkg of 25. Item Number: H20-A2453FN Have a question about this item? Find plenty of design inspiration in this themed set of antique gold-finished "pewter" (zinc-based alloy) beads and drops. 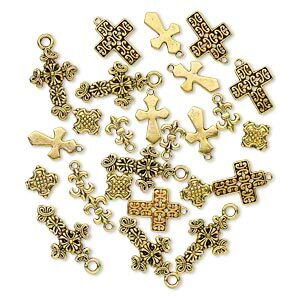 Package includes (5) 26x17mm single-sided filigree cross drops, (5) 12x9mm single-sided fleur-de-lis charms, (5) 19x16mm double-sided fancy cross drops, (5) 18x12mm double-sided smooth cross drops and (5) 12x12mm double-sided beaded cross beads. 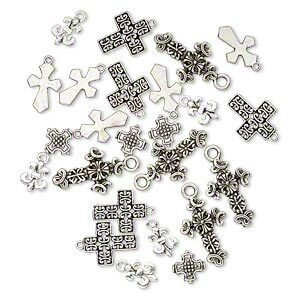 Bead and drop, antique silver-plated "pewter" (zinc-based alloy), 12x9mm-26x17mm single- and double-sided assorted cross. Sold per pkg of 25.